Eggplant is a member of the nightshade family and is closely related to potatoes and tomatoes. It is most commonly recognized as a large blackish-purple vegetable known for it’s use in dishes such as Eggplant Parmigiana, but a short browse through any seed catalog will reveal eggplant in all shapes, sizes and colors. 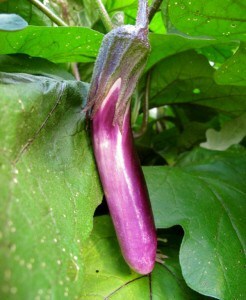 And while it is a beautiful and versatile vegetable, growing eggplant isn’t quite as easy as growing other nightshades. To get a head start on your eggplant it is best to start them from seed about 6-9 weeks before your last frost date. They are a warm weather crop and require a soil temperature of about 80 degrees F to germinate properly. The use of a heating pad, or keeping them in the warmest room of your home, will greatly increase your germination rates. Plant your seeds about 1/4 in. deep in your choice of seed starting medium. It should take between 1 and 2 weeks for germination to occur. You may notice that your eggplant seedlings are growing much slower than their relative, tomatoes, and that is because eggplant prefer warmer growing conditions. As it gets closer to spring you should notice their growth rate increase. Once your seedlings reach about 3 inches tall, transplant them into larger containers. You will not want to transplant your eggplant plants into the garden until the weather has warmed and the daytime temperatures are in the 70s. Flea Beetles are by far the worst pest for eggplant. They can destroy and kill a small plant in a matter of days if you aren’t careful. Starting with larger, healthy plants can go a long way on combating these bugs, but even then they may still struggle. I keep a good dusting of Food Grade Diatomaceous Earth on all of my eggplant for the first few weeks- reapplying after rain or watering. 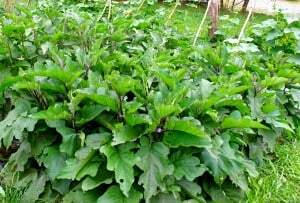 This is very effective in killing the flea beetles until your eggplant has grown large enough and strong enough to fend for itself. Other problems pests are the Colorado Potato Beetle and the Tomato Hornworm, both of which can be effectively hand-picked with out much trouble. Companion planting with beans and calendula can also help with these pests. Eggplant is also susceptible to verticillium wilt. Using proper clean gardening techniques and crop rotation can help in prevention. Eggplant can also do well in a large container- such as a 5-gallon bucket, if wilt is particularly bad in your garden. If you’ve never grown eggplant before, you may be wondering how to tell if your eggplant is ready for harvest. Eggplant should be picked when it is still on the small size, when the skin takes on a high shine. Like zucchini, you want to pick eggplant when they are immature. This lends to a better flavor and smoother flesh. Picking often will also encourage more growth and a more abundant harvest for you. When you cut open an eggplant, it should have a soft inside with very small, soft seeds. If the inside is on the tougher side or the seeds have begun to harden, your eggplant is past it’s prime and will most likely have a more bitter taste. Eggplant will keep up to 2 weeks in the refrigerator, but always try to use or preserve it right away. If you are lacking in recipe inspiration, here are more than 50 Eggplant Recipes to Try! Ping Tung: This is a long, thin eggplant that comes out of Taiwan. The plants are extremely prolific and the fruits are tender, mild and sweet. This is my favorite to grow! Purple Long: Coming from Italy, this eggplant has a more delicate flavor. It’s flesh is tender without a lot of seeds. Rosita: These eggplant are a lovely bright purple color. The flesh is white and mild and the skin is very tender. Black Beauty: This is your standard black, egg shaped eggplant. It requires a little longer of a season than some and isn’t as productive, but it is a good standby in your garden. Great info! Even here up north, I have grown eggplants in the greenhouse. Not always successful, but it still is fun. Isn’t eggplant just so gorgeous?! Thanks for sharing at Green Thumb Thursday and we hope to see you tomorrow! This is my first year of having two small raised beds for gardening. As a child, I came from a family of Italian immigrants that basically survived on their crops. A pity I didn’t pay attention to gardening as a child. Good to know. I am trying a white variety this year also. Fingers crossed, it will do well.